Gregory GOrDon has decided to ignore the advice of his attorney and release the information contained in his patent application for The Water Engine. GOrDon took the measure in response to several death threats and to raise money for the prototype. 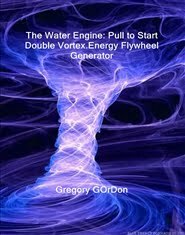 Press Release (ePRNews.com) - Orlando, FL - Mar 20, 2018 - Gregory GOrDon has taken the extraordinary step of releasing a publication of the material contained in his patent application for The Water Engine: Pull to Start Double Vortex.Energy Flywheel Generator two years before the patent office would have due to several veiled death threats that he received after he began work on the machine and built a website to record his progress. Under normal circumstances details of a patent pending machine or process is not released by the inventor or USPTO until almost two years after the patent filing. GOrDon’s attorney has warned that imitators may attempt to steal the idea and put it to commercial use without permission forcing GOrDon to sue to protect his patent, but he decided that this is much too important a machine for world development and progress to worry about the loss of mere money. The Water Engine as it is to be first mass marketed is as a small water heater tank sized machine that converts the mass of a moving body of water into energy by using the water speed increasing properties of a Vortex tied with the energy storage capacity of a flywheel along with small generators to produce electricity. The simplicity of the process and machine mean that the cost to produce it will be minimal and when used along with Net Metering Laws could earn machine owners a substantial amount of money. Net Metering Laws now in effect in 43 states and the District of Columbia allow electric utility customers to sell “green” electricity back to the utility at the retail rate up until their annual average consumption and at the “cost avoided” rate for all electricity produced thereafter. In Orlando a consumer could earn up to $144,000 a month for two megawatts of electricity which is the mandated amount that a utility must purchase back from each customer. In rural areas the machine can be used off-grid and with the “pull to start” version should not need any outside source of energy other than a simple pull on the starter cord. To raise money for the invention prototype GOrDon has published the details from the patent application in a short eight page document bound within a protective cover that will tell someone skilled in the art how to build The Water Machine. The booklet sells for $4.97 and GOrDon is hoping to sell a few thousand copies in order to raise enough money for licensing the patent and in order to build his final pre-production prototype. Although the information is now published it was all done under the terms of the law and not published until after GOrDon had actually filed the patent application. GOrDon’s publication is according to him a “Miracle Publication.” “It was really strange how the whole thing came out.” He states. “The pages just seemed to write themselves and the description of the process and corresponding chart just laid themselves out perfectly when it was printed.” Referring to a publication as a miracle is a natural for GOrDon who is a member of Mensa and is most famous as Black Jesus from the Howard Stern Show. GOrDon became famous after breaking into Ronald Reagan’s Retirement home on July 4th of 1990 and has written several books about Reagan as The Anti-Christ. Champagne Book Group signs David LeMaster and his horror/thriller Tick-Tock, Tick-Tock, Time Stops, Time Stops! Keep Your Self-Updated with TNBCLive News!